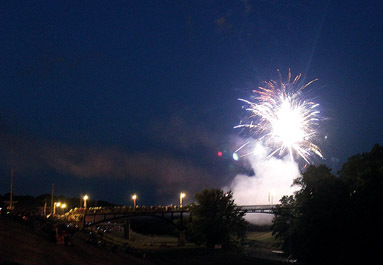 Fireworks from Galena’s 2012 Independence Day events. GALENA–The Kiwanis Club of Galena is sponsoring the annual parade on Thursday, July 4. A parade will take place on Main Street at 6 p.m., followed by music and food before the fireworks are launched from Grant Park at dusk. The theme for this year’s parade is “Celebrating Galena’s Heritage,” and the community is encouraged to participate by celebrating longtime Galena families, professions, organizations and churches, businesses and more with a parade entry. For more information about the celebration or participating in the parade, contact president Sarah Newton at 815-777-1765 or vice president Steve Bussan at 608-965-3013. This entry was posted in July 4 Events and tagged July 4 Events. Bookmark the permalink.